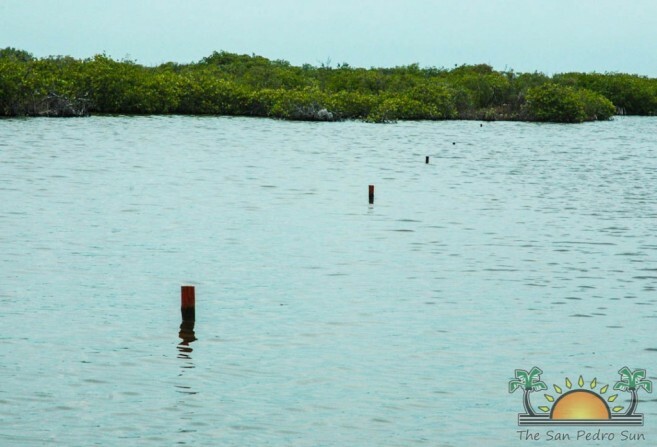 The Co-Chair of the Ambergris Caye Citizens for Sustainable Development (ACCSD) Phillip “Billy” Leslie has remained quiet over a portion of a proposed reserve wetland that is being surveyed for housing lots. 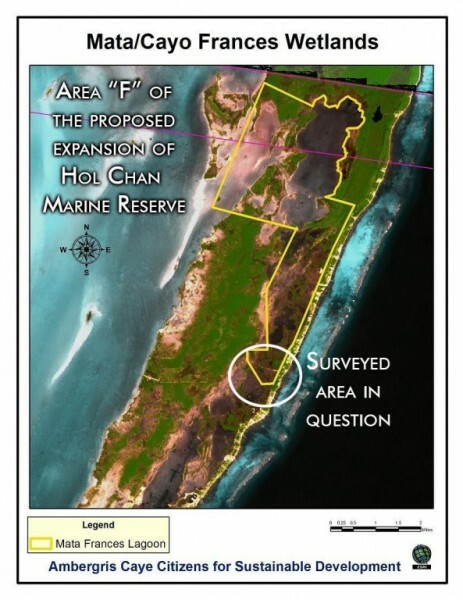 The area in question is 40 acres in size and sits on the southern tip of Area F of the proposed expansion of Hol Chan Marine reserve originally known as the Ambergris Caye Wetlands. The project was spearheaded by the ACCSD. Prospective parcel holders are being charged a total of $550 in survey and inspection fees, for a small parcel of submerged wetland that has been surveyed with the permission of the Government of Belize (GOB). A total of over 350 underwater properties have been surveyed and parceled out, ready to be distributed as part of a new subdivision in the Sunset Coves area, located about four miles north of San Pedro Town. 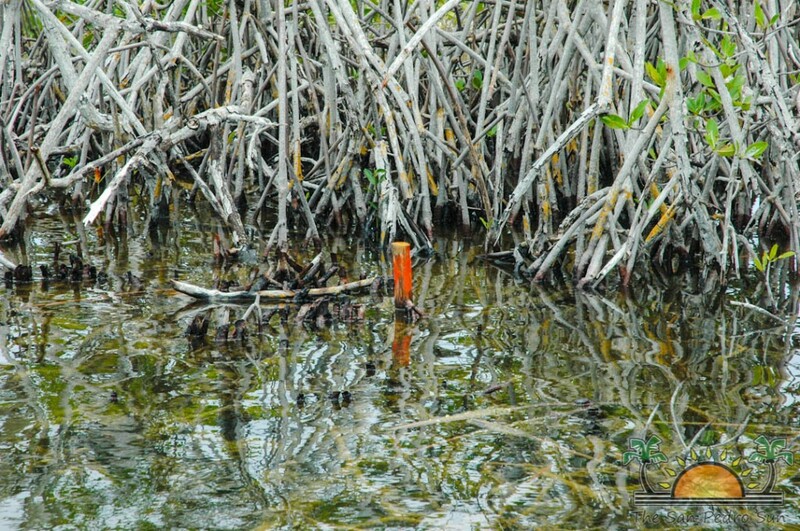 Most of the survey pegs are submerged under three to five feet of water, and the area in question is used by many fly-fishing guides as sport-fishing grounds. But most importantly, the patches of mangrove and lagoon area are prime habitat for juvenile fish and critical breeding grounds for many species of sea creatures that eventually make it to the reef. “If we continue parceling off our wetlands, we are zeroing in on our eco-system. 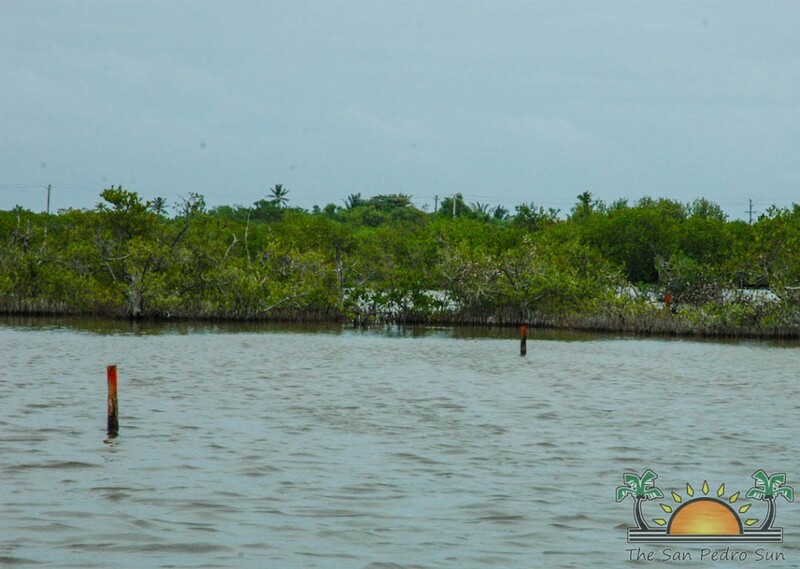 We will be killing the very same breeding grounds for the fish that make it to the reef – the very reef that we Belizeans are all proud to be owners of,” said Omar Arceo, a resident whose livelihood as a fly-fishing guide is being threatened. Speaking to Channel 5 News, Belize Fisheries Officer Beverly Wade conceded that the area being proposed for building expansion is a highly sensitive area. “There is an ecological function and there is some level of connectivity that exists between each of those ecosystems; between the shoal on the western side, the lagoonal wetlands and of course the reef system. Yes these areas naturally form these nurseries areas and so what they have in these areas are a lot of juvenile fish which attracts some of the best fly fishing sport species. The shoals are some of the most important areas for the tourism sector,” said Wade. 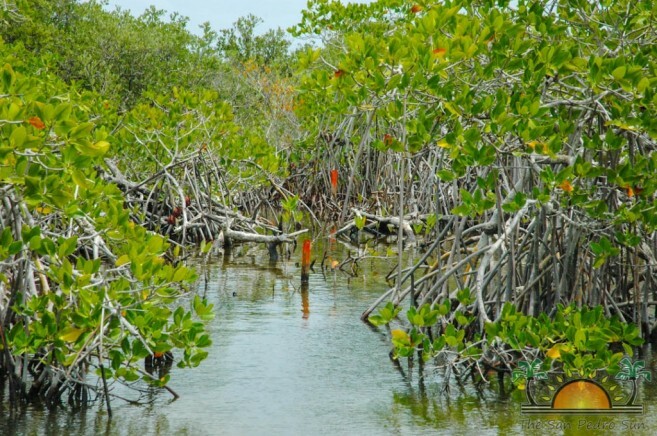 For that reason, in 2011 ACCSD financed a study, including paying for the arduous and expeditious process and several consultations for the proposed protected area under the Ambergris Caye Wetlands Project. During several public forums during the consultation stage, and even in a debate during the last election in 2012, Heredia Jr. gave his public commitment and assurance that the proposed expansion of Hol Chan Marine Reserve would be signed into law through a Statutory Instrument. The project sought to create a new reserve, but during the consultation process, stakeholders proposed and ACCSD adopted the recommendation for the project to be an expansion of the existing Hol Chan Marine Reserve instead of being a new stand alone reserve. The proposed expansion would include three main areas off and on Ambergris Caye such as the Mexico Rocks area along the reef, the wetlands near Mata and Frances lagoons the Bajos (shoal) on the leeward side of Ambergris Caye. But when the project was first taken to Cabinet back in early 2012, it received objections from at least two Cabinet Ministers including Heredia Jr. Those concerns ranged from the provision for the use of water on the leeward side of Ambergris Caye for traditional fishermen from mainland (mainly Bomba Village) as well as for allocation for future dredging areas for properties that were privately owned in or around the proposed reserve. Almost three years later, the proposed expansion project has stagnated, with GOB unable to sign the SI. As reported last week in The San Pedro Sun, because government has been unable to sign the SI, the Protected Areas Conservation Trust (PACT) cancelled a grant of $199,500 given to Hol Chan. The issue has taken a new dimension, since the new subdivision threatens to reduce a portion of the proposed expansion of the reserve. 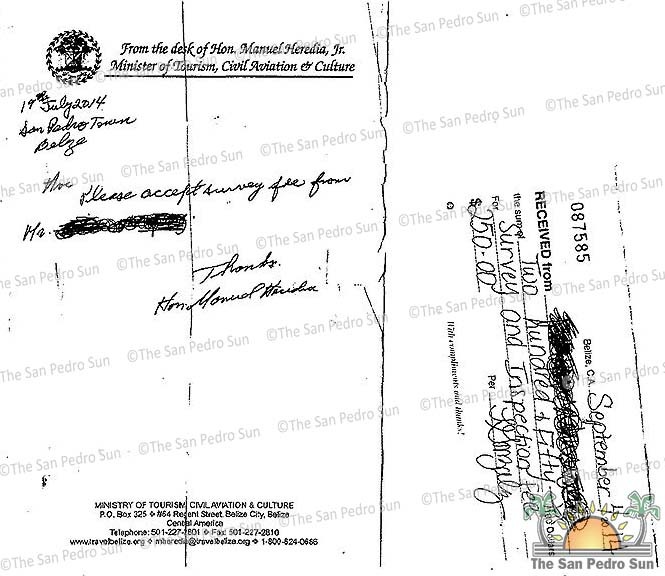 As recently as two weeks ago, GOB, through Heredia Jr. has been receiving payments for survey and inspection fees in the amount of $550 per parcel. According to two residents who paid for the inspection and subdivision fee, they were given the assurance that it was residential property and not swamp or lagoon. While there is the high demand for new residential lots for the growing population on Ambergris Caye, residents believe that the wetland and mostly lagoon area that will be given out, as it is not suitable for housing lots and would only create a similar or worse case such as the San Mateo development. While Heredia has declined to give comments to The San Pedro Sun, Channel 7 spoke with him briefly on his way to the island on Tuesday September 16th. Heredia confirmed that indeed a subdivision is planned for the area in question but said that the area is not a reserve. “Yes there is a subdivision we are working on and last night (Monday September 15th) I saw on the news the pictures of it. I will look at it personally on the site and if the area is not suitable then I will see that it is relocated… I must clarify that it is not a reserve. There is the proposed Hol Chan Marine Reserve expansion, but that has not been approved,” said Heredia. His brief comments have left more questions than answers, especially since Heredia also stated that he has not seen the area which he has subdivided and has only seen by way of the news reports. ACCSD co-chair Billy Leslie has refused to comment, indicating that he was unaware of the PACT grant that was cancelled and about the new subdivision in the proposed reserve. He said that he would not respond to “rumors.” However, several sources indicated that Leslie has been aware of the two issues since he was present at a stakeholders’ meeting where both issues were raised. The issues of both the cancellation of the PACT grant because of the inability to have the proposed expansion of Hol Chan Marine Reserve signed into law, and the subdivision being pushed into a fragile and important wetlands have infuriated many local residents as well as business people on the island. 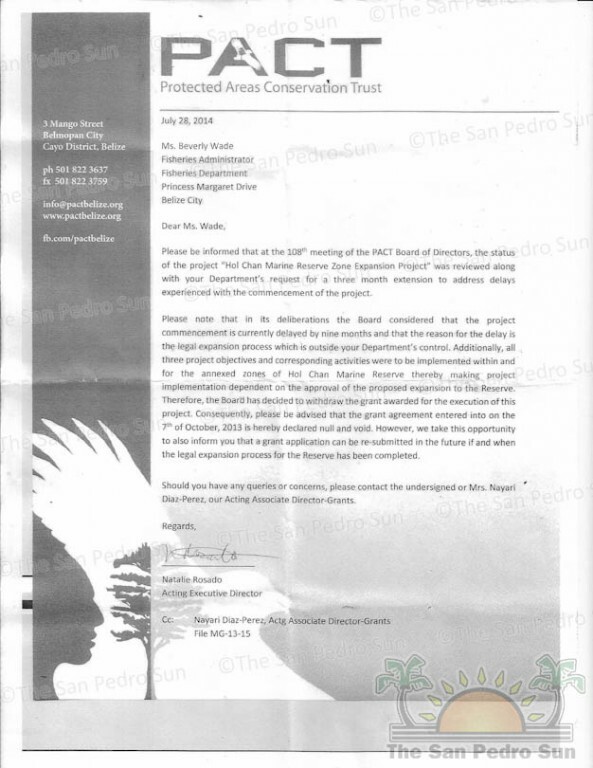 The San Pedro Sun will continue to follow up on any new development on the issues.